Part of a series stemming from his online science journal Edge (www.edge.com), including What Have You Changed Your Mind About? and What Is Your Dangerous Idea?, author and editor Brockman presents 136 answers to the question, ""What game-changing scientific ideas and developments do you expect to live to see?"" Milan architect Stefano Boeri responds with a single sentence: ""Discovering that someone from the future has already come to visit us."" Most others take the question more seriously; J. Craig Venter believes his laboratory will use ""digitized genetic information"" to direct organisms in creating biofuels and recycling carbon dioxide. Like biofuels, several topics are recurrent: both Robert Shapiro and Douglas Rushikoff consider discovering a ""Separate Origin for Life,"" a terrestrial unicellular organism that doesn&apos;t belong to our tree of life; Leo M. Chalupa and Alison Gopnik both consider the possibility resetting the adult brain&apos;s plasticity-its capacity for learning-to childhood levels. Futurologist Juan Enriquez believes that reengineering body parts and the brain will lead to ""human speciation"" unseen for hundreds of thousands of years, while controversial atheist Richard Dawkins suggests that reverse-engineering evolution could create a highly illuminating ""continuum between every species and every other."" 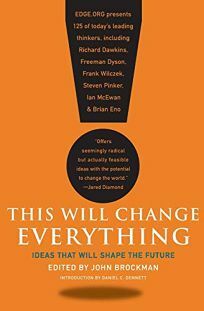 Full of ideas wild (neurocosmetics, ""resizing ourselves,"" ""intuiting in six dimensions"") and more close-to-home (""Basketball and Science Camps,"" solar technology""), this volume offers dozens of ingenious ways to think about progress.